Are Dogs Allowed on London Underground Tube Trains? 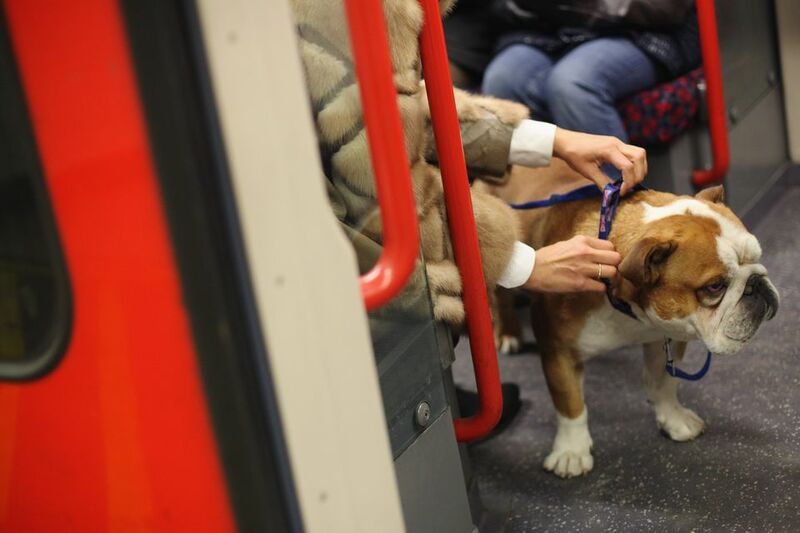 Whether you are new to London, or a canine is new to your family, you may be wondering whether you can bring your furry friend on the Tube—the city's underground subway system. The quick answer is "yes," but there are a few rules and restrictions. Service dogs, as well as any dog that does not appear dangerous, is allowed on the London Underground. The dog must remain on a leash or in a crate and is not permitted on the seat. You must keep your dog well behaved; staff is not allowed to control your pet. There is a bylaw regarding animals traveling on London Transport, which basically states they can refuse entry to your animal if they have any safety concerns and that you must control your animal. Before you get into the subway car you need to pass through the Tube station, which includes escalators, ticket gates, and platform. The first rule is that you must carry your dog on the escalators as they might hurt their paws getting on and off. (The exception is if your service dog it is trained to ride a moving escalator.) If your dog is too large to hold, you can ask a staff member to stop the escalator; however, they are more likely to do this while the station isn't busy. Of course, it's fine to use the stairs or elevator (or lift, as they say across the pond) with larger pooches. According to the TfL Conditions of Carriage, your dog needs to be carried through the ticket gates. If you have a service dog and there is not a wide automatic gate, you need to ask a staff member to open a manual gate. While waiting on the platform, you need to keep your dog on a leash or in their container and make sure they are well behaved. Perhaps you are taking the Tube to catch a train or transfer to a bus need to know if you can continue on with your dog. Each mode of transportation has its own rules, so it is important you understand what is permitted. According to the National Rail Conditions of Carriage, you can take up to two domestic animals free of charge and sit in the passenger cars, but not the buffet or restaurant cars (with the exception of assistance dogs). The dog(s) must be kept on a leash or in a carrier and are not allowed on a seat. The same goes for the public bus, but some companies may charge a fee for bringing a pet onboard (unless it is a service dog). The rules for bringing dogs on the London buses aren't as clear-cut so it is best to contact the specific bus service. And don't forget to keep your dog on a leash or in the carrier at all times, as well as keep your pet under control.